HomeBlogKristelApple Coffee Cake 6 Points Plus!! 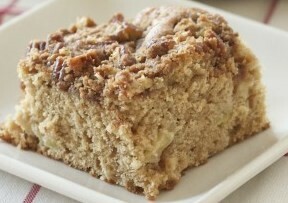 Here is a great recipe for an Apple Coffee Cake! Lightly coat a 9 x 9 baking pan with cooking spray; set aside. In a medium bowl combine the 2/3 cup all-purpose flour, 1/2 cup whole wheat flour, baking soda, the 1 teaspoon cinnamon, and salt; set aside. In a large mixing bowl toss together the chopped apple and egg substitute. Stir in 3/4 cup sugar, the 1/4 cup nuts, and applesauce. Add flour mixture (medium bowl) and stir just until combined. Pour batter into prepared pan. For topping, stir together the brown sugar, the remaining all-purpose flour, whole wheat flour, and cinnamon. Cut in margarine until crumbly. Stir in remaining 1/4 cup chopped nuts. Sprinkle topping over batter in pan. Bake in oven for 30 to 35 minutes or until a toothpick inserted near the center comes out clean. Cool in pan for 10 minutes. Remove from pan and serve warm.